Where Were You on Your Birth Day? *This post was featured in the NY Times Blog, Motherlode: Can We Have a Civil Debate Over Home Births? 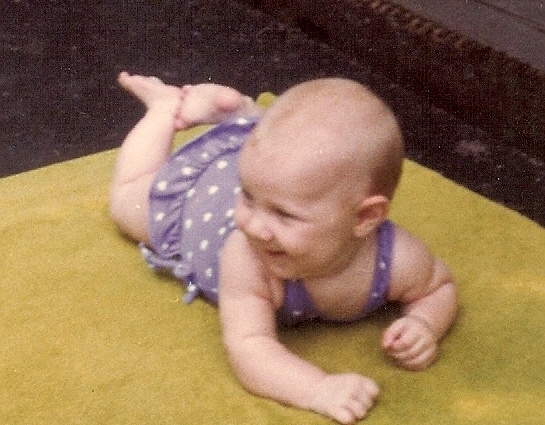 On this day in 1983 I had a baby. She was born at home, attended by two Certified Nurse Midwives (CNMs) and a birthing assistant, all of whom were associated with a nearby birth centre. I’m not going to relate all the details here, because the only thing more boring than other people’s vacation pictures is other mothers’ birth stories. But I will say this, complications ensued (APGAR = 2), the CNM’s acted with extreme speed and professionalism and my daughter, after spending a week in the DC Children’s Hospital ICU, came home on Valentine’s Day, happy and healthy. The only other fact relevant here is that her pediatrician assured me afterwards, that if I had had her in the local county hospital, she would have been born with the exact same problem and, from there, everything would have proceeded identically, including her transfer to Children’s Hospital. In other words, her problem and the course and timing of her treatment were not related to having her at home. Now, all that said, I am not here to evangelize for homebirths. In fact, my original topic for this post was just the opposite. I was going to tell how, after all these years, I have had a change of heart and now think that homebirth is probably a poor (if not dangerous) option for mothers and babies. I was going to tell you how mine was a decision made by a young mom (22!) who didn’t have a way to really research the safety of homebirths. There was no internet. All I had was my college library (remember how we did literature searches back then?) and popular books on childbirth. But, I did try to do my homework and based on what I found, I decided that home birth was a safe option. But I had no way to really know. Then I was going to tell you how I have recently come to the opposite conclusion. Not that I’ve immersed myself in the topic. I am long past having babies. But joining the online science community has exposed me to all kinds of people, discussions, and topics I never would have sought out on my own. One of those topics has been homebirths, which, because of my own experience, still catches my eye. And one of those people is Dr. Amy Tuteur, ObGyn. Dr. Tuteur is smart, well-spoken, seasoned, and most definitely no slouch when it comes to her profession. She is also vocally anti-homebirth and blogs strongly against it in several places. She is so vocal in online comments, in fact, that for awhile there was a rumour (unfounded) that she was, in fact, not even a person, but a team of people hired to denigrate homebirths. She’s that passionate. To me she seemed trustworthy, so I started following her with some interest and have been mentally writing a blog post about my change of heart on the homebirth front based on what she has said. She and other medical professionals opened my eyes to data and information that I didn’t have access to 29 years ago, and a lot it looked pretty frightening. But then, some of what I read on her blog and Facebook page, along with comments made by people who support her, started to bother me. Let’s go back a minute: One of the reasons I had turned away from the homebirth arena was that somewhere between 1983 and now it had turned into a movement. Movements are always suspect, especially when they become extreme. And that’s what had happened: Homebirth went from an option to a belief system. And the trouble with that is that people who share a strong belief system tend to reinforce each other and shun anything that is contrary to their belief, no matter how grounded in reality the new information is. With that comes a closed mindset that says you are either in or out; there is no in between. So today in the homebirth realm we get mantras like, “your body knows what to do”, “a breech birth is just another kind of normal”, “reclaim your body”, “birth is safe; intervention is risky” and how, if things go badly, “your decision to go to the hospital still belongs to you.” Add that to the fact that much of the homebirth movement has gotten all mixed up in homeopathy, waterbirths, unassisted births, the anti-vax movement, and enough other dubious practices that the whole thing reeks of woo. So I wasn’t surprised to find that there were doctors speaking out against homebirths – not to protect their jobs, as some homebirthers would have you believe, but to protect women and babies. Yes, we’ve been having babies for millions of years, but women and infants have been dying for millions of years. Just look at the infant and mother mortality stats (and more importantly, perinatal mortality rates) for countries without maternal healthcare to see how far we’ve come. Worldwide these mortality rates have improved, not because more women are having babies at home, but because more women have access to obstetric healthcare and hospitals. That’s why we have obstetrical support for childbirth. It SAVES LIVES. It certainly saved my daughter’s. But now the same kind of fanaticism that surrounds homebirthers, surrounds the anti-homebirth movement. Again we have people evangelizing about the one-and-only safe way to have babies – in a hospital under the care of an MD, enveloped by all of the trappings of modern medicine. Anti-homebirthers, many of them followers (dare I say, disciples) of Dr. Tuteur are just as shrill and polemic as the homebirthers. So what is the answer? Well, I certainly don’t have it. The whole debate has become too polarized and both sides are shouting and not listening. I will say this, however. I don’t believe there is one answer that fits all. I believe that, for a whole bunch of reasons, the hospital is absolutely the right place for many women to have their babies. I also believe that a well-equipped birth centre or home is a fine place too as long as you have a fully-qualified and experienced CNM (not a lay midwife or CPM) with medical backup and support nearby. Frankly, I think having your baby by yourself or with a lay midwife out on the farm is just asking for tragedy. So all of this has been rolling around in my mind for the past few weeks as I pondered this post and how I was going to approach it. And then, like a wish come true, I came across this post, by Emily Willingham, written as a clarification and expansion on her Slate post. And she did it… she brought a measured view to the issue –without drama, extremism, and, importantly, without falling into the trap of having to align herself with a pro- or anti-homebirth camp. So, if you have found your way to this blog post because you are debating a homebirth, set aside an hour of your life and click that link. Read Emily’s post end-to-end, and then read every single comment after it. There you will find a balanced discussion by thoughtful people who, for the most part, are not part of either reactive community. Click through to as many of her links as you have time for. At least get the 3 or 4 and the end of her post. Also read Dr. Tuteur’s blog. It will scare you. And it should. Birthing a baby is not a trivial act. People do die in this process, so don’t just blow her off as a fanatic. Take what she’s saying seriously and think hard before you decide where to have your baby and who should be in attendance. If you are leaning towards homebirth, look out your window and ask yourself how fast you and/or your baby could get to a hospital if the need arises, because there is a pretty good chance it will. Both blogs are worth reading and I think you’ll come away with a more balanced view of homebirth and a better sense of how to choose where you will spend your baby’s birth day. APGAR 2 and she was tinged a Smurf “blue”. It made for an exciting birth. Home birth/hospital birth, what you didn’t mention was YOUR pre-natal regime of exercise, vitamins, healthy eating, living habits, and post gestational health research. Regardless of the last minute complications, YOU created an environment (a womb with a view) that fostered a healthy baby that had the ability and “reserves” to survive the complications. 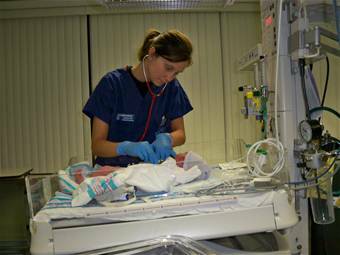 Compared to the other infants in the neonatal ICU this little girl was a giant. Her size and overall general physical condition (for a lack of a better word) provided her with an advantage – the nurses and doctors acknowledged this. The benefits of proactive pre-natal care really made a difference and cannot be understated. Your point is good about the prenatal care. I worked hard at that. But, the point I’d like to make is, that all the prenatal care in the world will not prevent complications and emergencies. It makes for a strong baby and a strong mom, but it’s not a magic bullet. I know I went into the birth (probably like a lot of new moms) assuming that everything would go smoothly because I had done everything “right”. And then it didn’t. We were fortunate to have well-trained experienced professionals on hand who knew exactly what to do and, importantly, how fast they had to do it. Nobody hesitated because “intervention is bad” — they intervened! Nobody let the decision “belong to me” — they just picked up the phone and called the ambulance. Nobody gave me a choice because there was only ONE choice — our baby needed emergency care right NOW. The point is, when you are talking life and death, you can’t get hung up on the dogma of a polarized belief system. And if you are a mom who clings to such a belief system, if a crisis occurs, you need pragmatic professionals on hand who are willing to step in the right direction, with or without your approval, to do the best thing for you and your baby. Believe me, you will thank them later. Great blog. I know Xan and she turned out great. I remember you telling me about the birthing experience and how you were surprised the hospital allowed parents to take their babies home w/o some sort of manual. Kudos on a mention in NY Times!